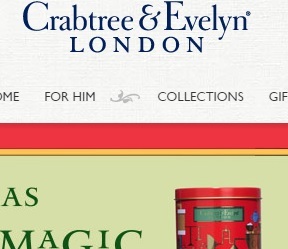 The new Crabtree & Evelyn flyer and online specials. Save with this week Crabtree & Evelyn coupons and deals at your local store. Here you’ll find the most current Crabtree & Evelyn flyer featuring great prices on: Evelyn Rose Deluxe Gift; Lavender Deluxe Gift; La Source Deluxe Gift; Summer Hill Memory Makers Ultimate Gift Set; Pear and Pink Magnolia Trio Memory Makers Ultimate Gift Set; Travel Manicure Kit – Cornflower; La Source 60-Second Fix for Hands; Cozy Socks – Berry; Apple Snow Hand Therapy Cracker; Citron, Honey & Coriander Memory Makers Ultimate Gift Set; Hand Therapy Musical Tin – Set of Six; Windsor Forest Three Wick Poured Candle; Windsor Forest Botanical Candle; Noël Noel Room Spray; Fine Food Collectible Design Tin; Festive Bauble Trio; Musical Tin with Mini Shortbread Biscuits; Fine Food Star-shaped Shortbread Biscuits; All Butter Dark Chocolate Chunk & Hazelnut Biscuits. 100 Bayshore Drive, Nepean , ON K2B 8C1 – the entire list can be found here. Find all deals and offers in the latest Crabtree&Evelyn flyer for your local store. Shopping online or just collection all the information needed from retailers flyers is an excellent means for saving money on all needs for family and home. On yFlyers.com you will find all your favorite flyers, online, in a single place - no need to search for the latest flyer issued by your nearby store. Instant and free access to a comprehensive list of all new flyers and circulars from all your favorite local - no matter which state/city you're on: Ontario (Toronto, Ottawa, Oshawa, Mississauga, Brampton, Hamilton, London, St. Catharines-Niagara, Windsor), Quebec (Montreal, Quebec City, ), Alberta (Calgary, Edmonton), Manitoba (Winnipeg), British Columbia (Vancouver, Victoria), Nova Scotia (Halifax) or any other Canadian town - stores. We follow more than 30 retailers and groceries, some of them: Metro, Giant Tiger, Target, Canadian Tire, Walmart, Superstore, Future Shop, Loblaws, Sobeys, No Frills, Food Basics or Freshco. Don't miss out! Sign up for our free Email Alert powered by Feed Burner and get the best flyers and ads delivered straight to your inbox, daily, after they are published.